Hi there! My name is Love, mama to 2 beautiful little girls and creator of Munchkintime. 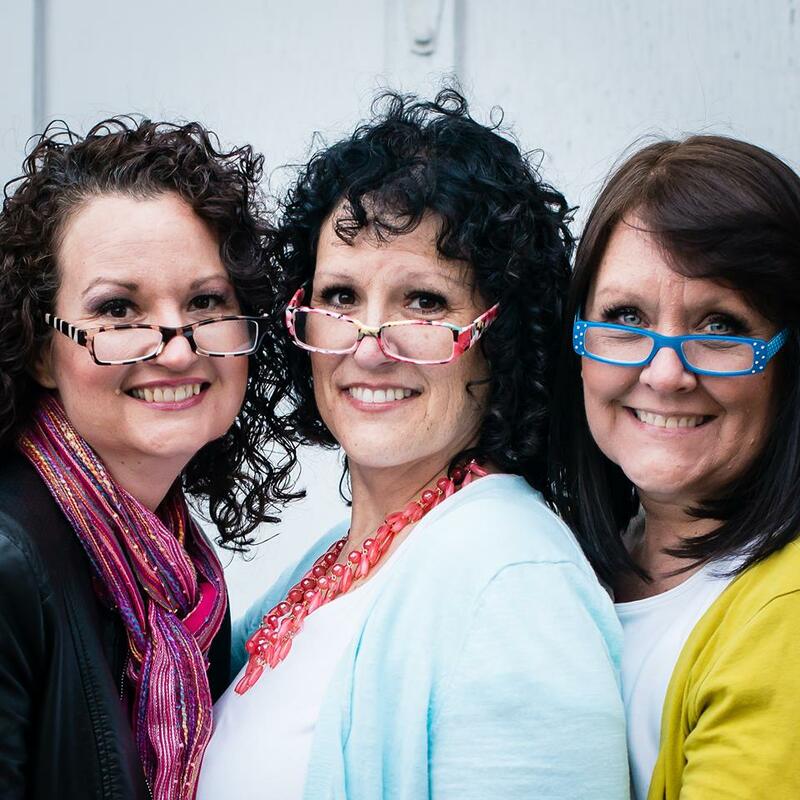 I am so thrilled and thankful for creators Debbie, Tracy and Sherri of Made From Pinterest, for giving me this amazing opportunity to share my recipes with you dear readers. 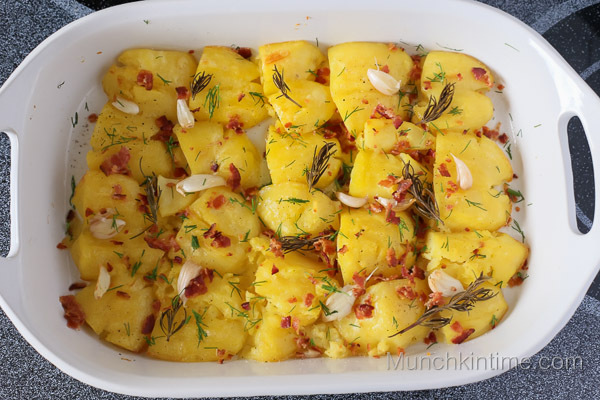 It is made of golden potato, fresh rosemary stems, baked bacon, lots of garlic and simple salt and pepper seasonings. 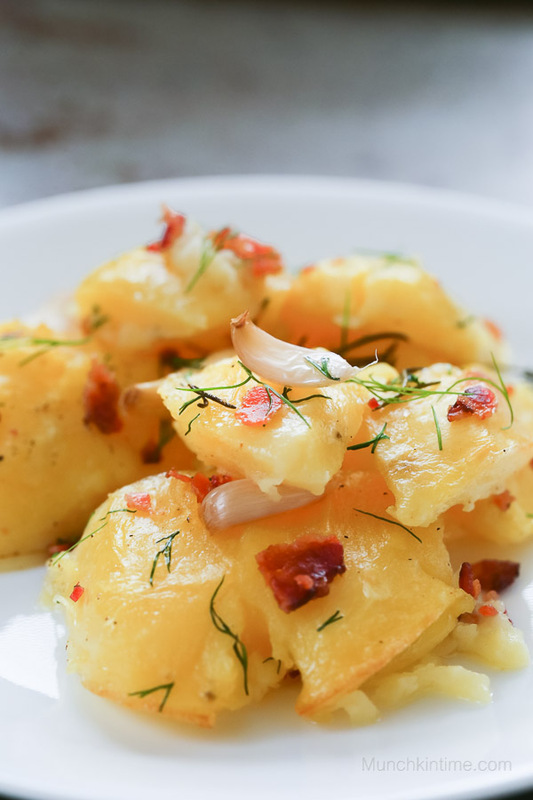 You will love this recipe for its cooked, soft and roasted potato texture. Rosemary aroma will make your kitchen smell like fall. Perfect comfort food that you and your family can enjoy for a dinner! Give this recipe a try for this upcoming Thanksgiving dinner, your guest will be begging for a recipe! 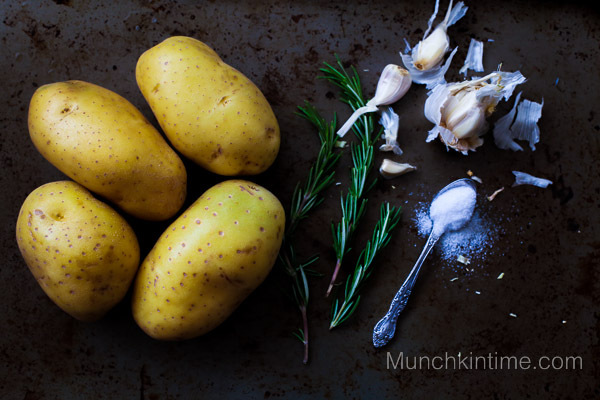 Peel potato and rinse it in cold water. 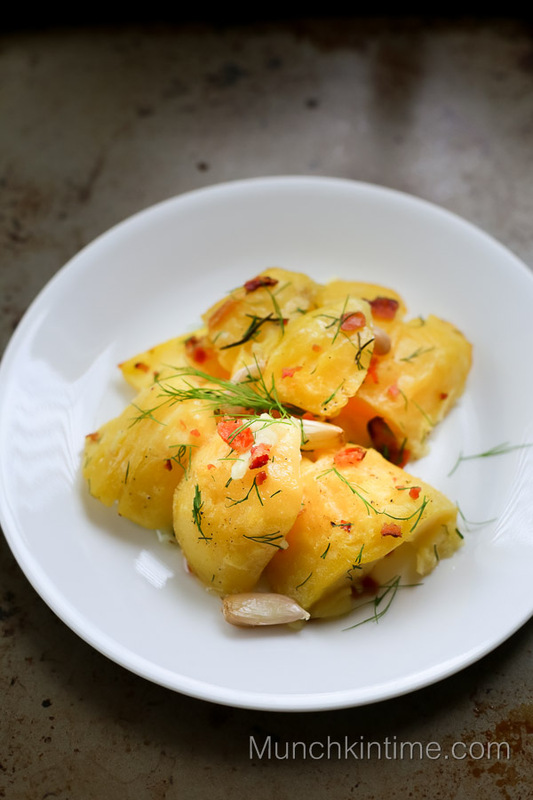 Slice each potato into two halves. Place it in the pot filled with cold water, add salt. Bring it to a boil, turn the heat down to medium heat and cook for 10 minutes. 2. Once it is done cooking drain the water, let the potato sit in the strainer for a few minutes so there will be no extra water. 3. 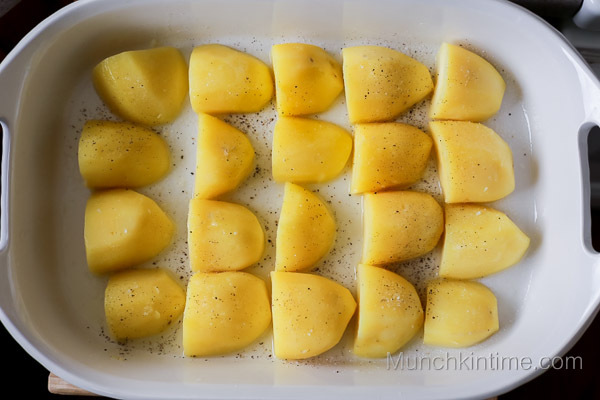 Grease baking pan with 2 tablespoons of olive oil, place potato into baking pan and season with salt and pepper. Put in the oven and bake for 30 minutes. 4. 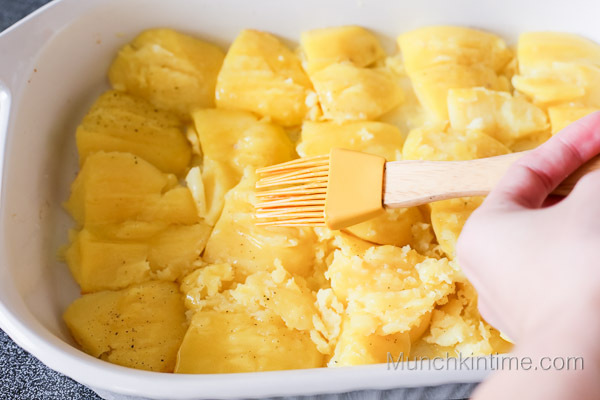 After it’s done baking for 30 minutes remove potato from the oven. 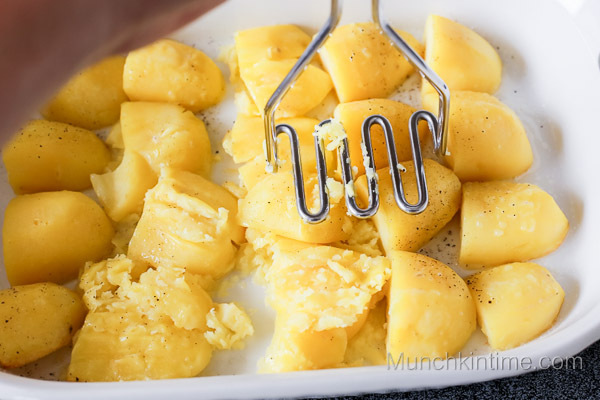 Using a potato masher, mash potato tops like shown in the picture. 5. 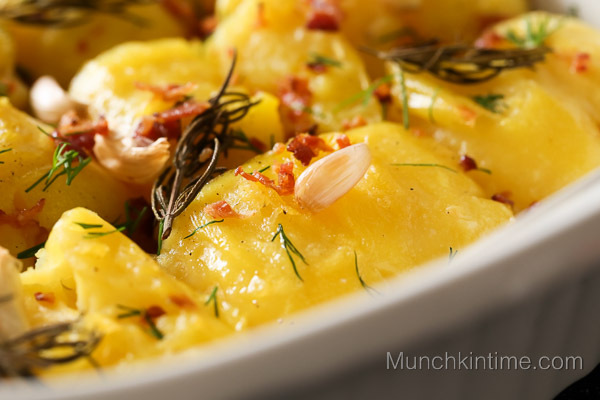 Sprinkle 2 tablespoons of olive oil on top of the potato or brush it with a food brush. 6. 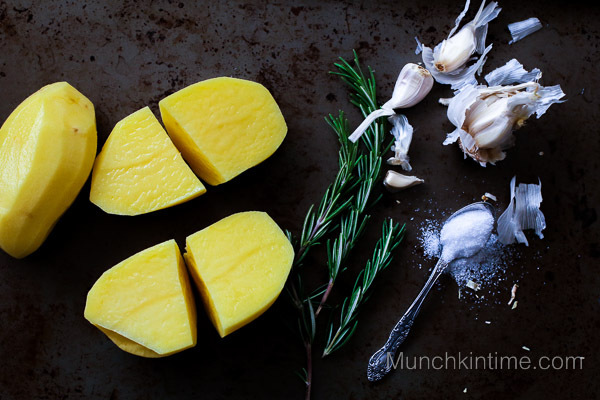 Add unpeeled garlic and cut rosemary. 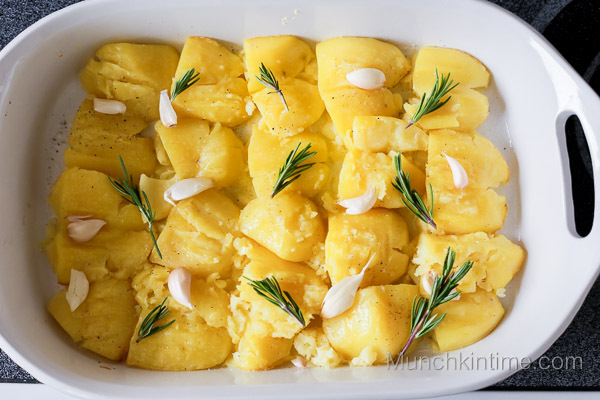 Return potato into the oven and bake for 40-45 minutes. 7. 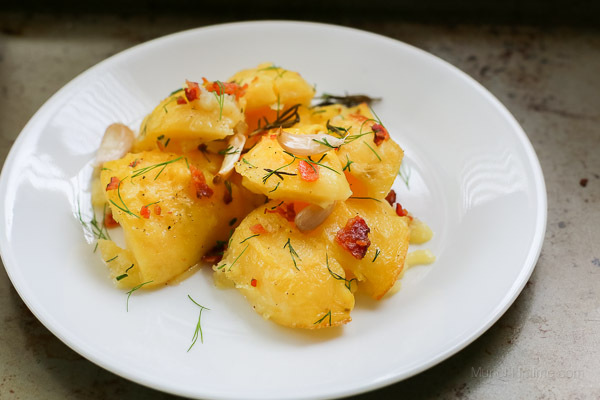 Garnish with bacon and chopped dill and serve with your favorite salad. If you make this dish PLEASE tag @munchkintimeblog and use a hashtag #munchkintimeblog on Instagram, I would LOVE to see your creation, Thank you!